First and foremost I just want to say how disheartened I am over the tragic events in Newtown, CT on Friday. I was subbing on Friday and didn't hear about it until that afternoon after school. As a mom of a kindergartner and 2nd grader my heart is so heavy. I have been hugging my boys so much this weekend! We must never take for granted our loved ones! I want to say thank you to all the teachers out there who take such good care of our children! And Newtown...my heart goes out to you! I am praying for you! We've had a great weekend so far! I ran my last long run for marathon training before taper time yesterday. The run was AWFUL but I will tell you more about that in a different post. The rest of the day was spent with the family. We went to a Christmas River Parade last night and had a blast!!! This morning I am singing in my church choir's Christmas Musical. I am looking forward to sharing the story of Christmas and the birth of Jesus through music! 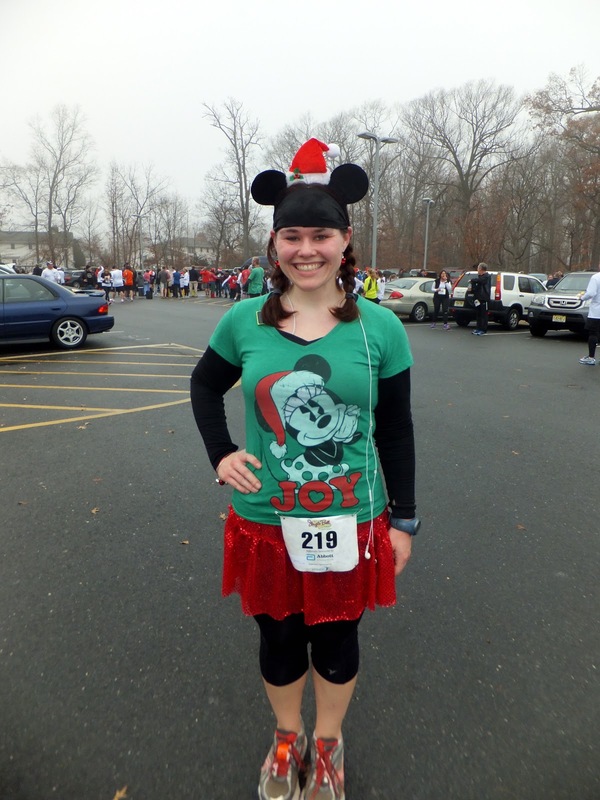 Now it's time for another runner spotlight! If you are interested in being spotlighted please send me an email to mindy@roadrunnergirl.com! Today I am spotlighting Jennifer from The Final Forty! She has an amazing weight loss story and I can't wait for you to hear it!!! So please continue reading to find out more about Jennifer! I began my weight loss journey at 265 pounds five years ago, and integrated running as soon as I could convince myself that I wouldn't drop dead right there on the treadmill. I started with slow, intermittent jogs and kept increasing their length until I elatedly discovered I could make it all the way around the two-mile trail at the park near my home. I didn't muster the courage to register for my first race – a local Firecracker 4-miler on July 4th – until 2011. At first I ran just to burn the most calories in the least amount of time…but now I’m officially addicted to running and racing, and it’s all about setting a new PR! Pretty much any race where I get to dress up in a costume! It seems I perform better when I’m wearing a Sparkle Skirt or funny hat…or even just a festive Bondi Band. I’d have to say crossing the finish line of my first 10K in September was my finest running-related moment yet. I had raced in 5Ks and a handful of 4-milers, but never in my wildest dreams could have imagined that I could complete a 6.1 mile race. It was a ridiculously hilly course, but I ran the entire race and finished with a sub-60 minute time. It was the moment I finally allowed myself to believe that I was a “real” runner! I’m still perfecting this…and, not surprisingly, a lot of my routine revolves around food. Thus far, I've figured out that polishing off a bowl of oatmeal (I prefer mine with honey, brown sugar, and raisins) at least two hours prior to race time is the only way not to end up hobbling through the third mile with stomach pains and cramps, which has proven my biggest obstacle both in my training runs and races. I apparently have a sensitive stomach – who knew? I also tend to be just a tad high-strung, so to ease my inevitable race day jitters, it is absolutely crucial that I have everything ready to go the night before – my outfit, fully-charged iPod and Garmin, and everything I’ll need to take with me to the race. I also have to arrive early, to avoid any panic attacks over the parking situation. I’m a perfectionist and notoriously hard on myself, so when it comes to the actual race, the most important part of my race-day routine has been developing the ability to accept my best efforts and be proud of my time…no matter what. Hands down, it has to be my Garmin Forerunner watch. Running is such a solitary sport, and it’s nice to have what feels like a personal trainer strapped to my wrist that can let me know when I’m not quite pushing hard enough – or, when I’m doing better than I thought. Other than my sneakers – always a challenge for me, a 10W – the Garmin was my first piece of running gear. When I took the first run with my Garmin, it felt like the first time I was out there because I was a “real” runner looking to improve their speed and distance, and not just someone trying to burn calories for my next weigh-in. I lost 90 pounds following the Weight Watchers program, and though I still battle with discovering what my true “goal weight” should be – pretty much what inspired my blog! – I don’t think I’ll ever look at food without calculating its POINTS value. Now I’m learning how to balance the program’s emphasis on controlling carbs with fueling my body to endure my current 25+ miles per week, and train for my first half marathon in February. I remain something of a food snob when it comes to what I put into my body, and I’m obsessed with trying to eat as “clean” as I possibly can. But now I’m in that fun phase where I get to experiment with all different kinds of healthy foods to see how they’ll affect my next run. That “bad runs” happen…and that it takes lots of time and consistency to improve. 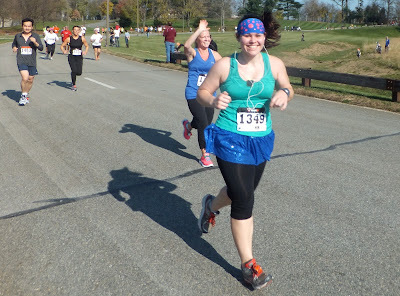 I can’t tell you how many times I’d have a hard run or fail to meet a time goal during a 5K and stop running, for days or even weeks at a time, because I’d convince myself that I wasn't getting any stronger or faster -- or worse, that I was simply “too fat” to run and should just give it up already. Now I realize that when I’m training properly and consistently, I will probably perform better…but, then again, I might not. Like weight loss, I've learned that there are a million factors that can affect my performance every time I lace up my sneakers (or step on the scale), and no matter what happens, every mile (and pound!) is an accomplishment worth celebrating. I've been struggling with obesity since the second grade, so for someone like me, running is so much more than setting PRs. Crossing the finish line of a race feels like taking one step closer to finally letting go of the person I used to be. But if I had to pick just one memory, it would have to be running the Pancreatic Cancer Action Network’s PurpleStride 5K in honor of my grandpa in November 2011. He was a diehard Johnny Cash fan, and just as I crossed the finish line and yanked out my earbuds (I had been listening to Johnny Cash during the race), I heard “I Walk the Line” start playing over the sound system. I knew I had made him proud. I’m hoping another fond memory is yet to come. I've registered for the Disney Princess Half Marathon in Feb. 2013. It’s my first half marathon, and I've been a Disney fan (okay, I’m obsessed) since I was in diapers. These days, the only thing pushing me through those exhausting long runs is fantasizing about the moment I cross that finish line at my happy place: Walt Disney World. With the exception of a handful of friends (and my family and boyfriend, of course), people who know me today have no idea how unhealthy I used to be, or how I still have to battle the urge to overeat every single day. Very few people know just how severely I was bullied all throughout my elementary, middle, and high school years because of my weight, and how much it has shaped me as a person. I desperately tried to hide my weight problem for so many years (as much as you can when you’re 5’3 and 265 pounds), but now I try to share my story with anyone who will listen. Five years ago, I couldn't climb a flight of stairs without getting winded, and today I’m training to run a 13.1 mile race. I’m not the thinnest runner – and I’ll certainly never be the fastest – but I want people to know that I’m proud to wear running shorts, loose skin and all, and that I run because I can. Here are all the different ways you can connect with Jennifer! Thanks so much for sharing with us Jennifer!!! QOTD: Is attending a Christmas parade part of your Christmas tradition?